Investors want access to information, and they want it, whenever possible, to come from their advisor via a website or app. Advisors and financial providers are encouraged to keep their internet technology up to date to provide account information, as well as articles, blogs, video presentations in a timely and modern fashion. But investors also want their personal information to be kept out of the hands of hackers and identity thieves. Security of personal information is a priority for many investors who conduct business electronically. That presents a problem for advisors and providers who want to be as accessible as they can be in as safe an environment as possible. Advisors are going to do everything they can to keep the personal information of clients safe, just as they safeguard the assets investors provide to the advisor for investing purposes. But anyone who says they have all the safeguards they need on electronic information are just talking: in today’s age of hacking and computer viruses, there seems to be no completely safe haven of information. When advisors discuss financial matters with investors, they need to present a clear picture of the advisor firm’s security systems. This is a topic in which there cannot be too much information provided; investors will want to hear everything a firm has in place to protect vital investor information. The demand for information via websites and social media grows consistently. Investors want to be able to access their account information and keep an eye on their portfolio whether they are doing so from a personal computer, a tablet or a smartphone. Spectrem’s wealth research, Using Social Media and Mobile Technology in Financial Decisions( italicize or bold title), lists some of the programs or tools investors want advisors to provide on their websites or apps, including budgeting tools, financial planning tools, and a tool to consolidate accounts from multiple providers into one place. In the same study, 45 percent of UHNW investors (those with $5 to $25 million of net worth) explain they want an online financial statement from their advisor (although 53 percent claim to retain a hard copy for their records). At the same time, 66 percent of UHNW investors worry about their financial information on social media platforms, and 62 percent worry about their financial information being available on an app. Obviously, there is a conflict between wanting information to be available online and fearing that information is not safe online. Investors are not likely to forego the practice of looking up their account information if safety is a concern. Instead they are likely to find a firm to work with that has top-of-the-line, completely up-to-date security processes in place. Just as social media requires constant attention due to the ever-changing landscape, so too does security require constant monitoring. Advisors do not want security issues to get in the way of landing or retaining clients, who themselves balance security concerns with the desire for information via electronic means. Security is everything in financial matters. Advisors and financial providers must do everything they can to keep financial records and information secure in an environment where conditions change regularly. That being said, investors want to be able to access their personal information. Financial providers and advisors must be able to present both sides of the coin, and let clients know that both needs can be met. Find out what investors want in terms of available information. 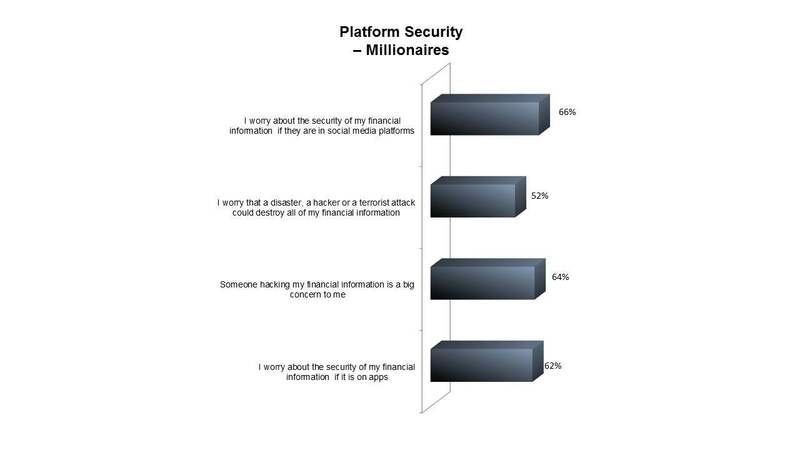 Most investors want access to their account balance, which requires significant security. However, if your website includes only blogs and articles, security concerns are different. Despite what you may have available today, accept the fact that future and younger customers will demand even more information online....as well as through social media and other channels. If you are not part of a larger organization that deals with these issues on your behalf, it may be smart to develop a relationship with a technology organization that can assist you with these matters.